As we start the International Year of Family Farming, there’s no better time to talk about innovations in food security that are being explored by CFTC’s partners. While it’s early days yet, we are delighted to bring you a sneak preview of four important projects that have been launched or will be launching soon in Ghana, Uganda and Bolivia. 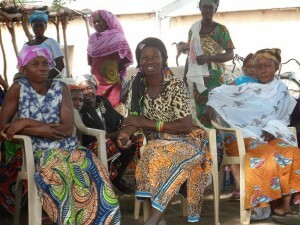 Members of a TUDRIDEP-supported women’s agriculture group who are germinating, grafting and selling mangoes. The mango grafting project has been underway as part of CFTC’s Climate Change Adaptation in Northern Ghana Enhanced (CHANGE) project for close to a year, but is shortly to expand to include even more women at more stages in the process, offering them lucrative new income-generation opportunities. CFTC’s partner TUDRIDEP, located in Ghana’s Upper West Region, has supported the development of a unique method of grafting mango seedlings onto trees which yields a much larger fruit with shorter growing time. Larger fruit, shorter growth period = higher value at market! The entire process – from germinating the seed to grafting it to harvesting it to selling it at market – enables Ghana’s smallholder farmers, and in particular women’s groups, to be involved at each stage. They are gaining skills and achieving results in terms of increased family income, better family nutrition, and improved resilience through climate-change adaptive agriculture processes. A win-win-win situation for all. Beekeeping (or more properly, “apiculture”) is getting great buzz throughout Africa. Rearing honeybees to produce honey and other products not only provides alternative livelihood options, but it preserves biodiversity and increases crop yields through more efficient pollination. 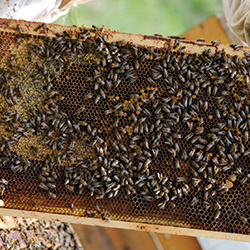 The 12-month Beekeeping for Income and Biodiversity (BIB) pilot project is aimed at providing new income generation opportunities for low- or no-income rural women. CFTC’s Northern Region partner RAINS is planning to establish 30 beehives in each of its two CHANGE project communities, Biu and Bidima, for six women’s groups comprising approximately 100 women starting in Spring 2014. The soon-to-be-beekeeping women will be selected through Village Savings & Loans Association (VSLA) microfinance programs, and will be provided with training on beekeeping, financial management, processing of honey and other bee products, packaging, and marketing. Honey is in great demand as an export commodity but Ghana’s current production capacity significantly falls short of that demand, so there is a potential for very high value for very low investment. 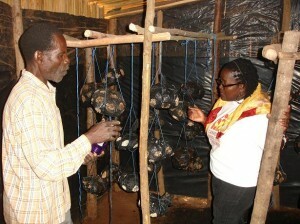 Abubakari, a HUYSLINCI volunteer and parent (left) showing Amboka Wameyo, CFTC’s Regional Program Manager – Africa, an indoor hanging mushroom farm. Based in Entebbe, Uganda, CFTC partner HUYSLINCI is one of the most innovative programmers among our international roster of partners. Their “pay-it-forward” livestock distribution system has helped thousands of impoverished women gain skills in animal breeding and care, improving food security for these women and their families as a result. HUYSLINCI’s latest agriculture program takes things in another new direction: from chicken, goats and pigs to … mushrooms. HUYSLINCI has initiated an indoor mushroom garden project that helps parents (VSLA members) grow and sell mushrooms alongside existing initiatives such as kitchen gardens and small animal reproduction and redistribution. It looks … well, if we’re honest, a little weird … but the ‘shrooms are growing well and not only do they have the potential to increase income, they will also help to improve nutritional diversity. 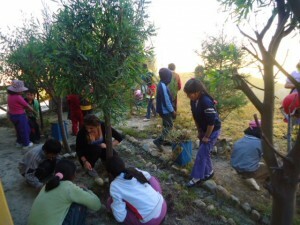 Primary school students taking care of the garden at SCSJ’s Las Lomas after-school centre. Leaving Africa, we travel to Bolivia where school gardens are starting to sprout at CFTC partner SCSJ’s after-school centres in the La Paz suburbs of Las Lomas and Alpacoma. Targeted to 400 children aged six to 12, the urban community garden model is designed to build skills among school children, parents, and educators in urban agriculture, reduced-space gardening techniques, knowledge of food and good nutrition, and awareness of environmental issues related to growing food. As in Canada, where school gardens are now well-established as part of nutrition education and food security programs, school gardens offer a wide variety of benefits to even the youngest children who learn where their food comes from and gain immense satisfaction from being able to plant and watch food grow. Perhaps even more critical, parents are becoming involved and learning about culturally-appropriate food preparation and proper child nutrition. While there is a way to go to grow enough food to supplement school feeding programs, that is definitely the goal.